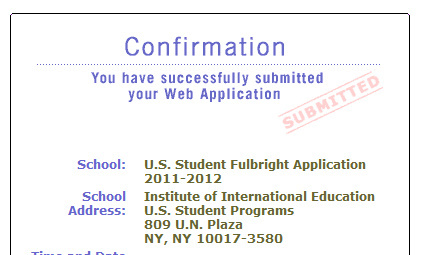 I submitted my Fulbright application. And now I wait! The application process was no joke. First I had to let my undergrad, Vassar, know that I was applying. After much back and forth with the Office of Fellowships (mostly stupid questions from me like, “can I mail or fax this form back to you?”), I was in the system and ready to go. I completed the lengthy application form, wrote two essays, uploaded scans of all of my transcripts (the dilemma of getting a 2-page transcript into one jpeg was an academic exercise in itself), proved that I was accepted to the University of Amsterdam, harassed my references to write something impressive about me, triple checked everything, and pressed submit. At that point, I was subject to Vassar’s process. I was assigned a professor as an adviser, in addition to the larger review committee. After a few weeks, I was told to make two appointments: an interview with my adviser, and a call with the Director of the Fellowships office. The adviser gave me incredibly helpful feedback and advice for strengthening my application, mostly related to beefing up the academic perspective of my project. She later sent me a marked up version, even incorporating her thoughts on our interview. The following day she sent me a list of articles to read and consider. Thoughtful and helpful mostly, but also a tiny bit overwhelming. Last step was a call with the Fellowship director. She gave me a few more tips for cleaning up the application. And then I was on my own again. I wouldn’t be me if I didn’t procrastinate a bit on this, especially considering how on-time I was for the first round. So I waited until the day I had to submit it to actually sit down and mentally prepare myself to revise my essays and the application overall. I was told I could submit it late that night. So I consider myself ahead of the game having submitted before 9pm. And that’s all I can do. Waiting to hear from the University of Amsterdam was worse, I’m sure. Because although this funding would be huge and life changing, it wouldn’t necessarily dramatically change the course of things. I’ll be in Amsterdam regardless of how this turns out. But still, the idea of more powerless waiting for something I really want sounds less than thrilling. To add another layer of intrigue to the already compelling situation, I’ll hear the results (of the first round, at least) on my birthday, January 31st. This also happens to be the first day of the semester. It also happens to be Queen Beatrix’s birthday, the Queen of the Netherlands. If it’s good news, perhaps she’ll have a drink with me…after class, of course. Thank you! Any help I can get is appreciated.